Vietnam has not been built as fruitful as their neighbors Khmer or Cham. Vietnamese do not have many graceful temples and towers throughout many regions of the country, but even so Vietnam still can sing their own praises with an eclectic collected works of relics. There are many temples and shrines have been established hundreds of years ago all the way through major cities of the country. In Vietnam, you cannot find any national religion, but it is easy to come up with what so-called “the traditional religion” such as Buddhism, Christianity, Islam, etc. When those religions had been introduced into Vietnam, they somewhat partly have been integrated and transformed into something that is unique and bearable Vietnamese-characteristics. Among all them, Buddhism is the religion that has most deeply influence towards Vietnamese spiritual life and beliefs. 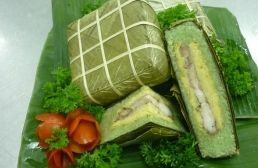 It can be considered as a part of social life and culture of Vietnam. There are two main categories of holy places in Vietnam that are Pagodas and Temples. All of them are the essences to the time-honored Vietnamese life as well as symbols of the connotation to the Vietnamese mores. Ngoc Son Temple is the most visited temple in the capital of Hanoi and was built since 19th century. This spiritual location is located on a small island in the northern part of Hoan Kiem Lake. 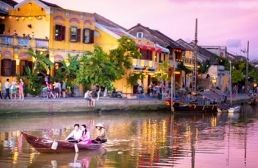 The temple is connected with the shore by a graceful bridge called The Huc Bridge built in the traditional style of Vietnam. Ngoc Son Temple is a place dedicated to national heroes. Van Xuong, Quan Vu, La To and Tran Hung Dao are honored here. The temple’s back has a turtle weighing 250 kilograms found in the lake. The Temple of Literature is a temple of Confucius,located 2 kilometers to the west of Hoan Kiem Lake. Van Mieu - Quoc Tu Giam is a renowned historical and cultural historical location including the Temple of Literature and Vietnam’s first university. It was constructed in 1070 in respect of Confucius, his followers and Chu Van An, a decent figure in Vietnamese education. During its hundreds of years of activity, thousands of Vietnamese scholars had been graduated from this academy. The One Pillar Pagoda is a momentous Buddhist temple in Hanoi which is regarded along with the Perfume Temple, as one of Vietnam's most iconic temples. Amongst numerous beauty-spots in the capital city, the One Pillar Pagoda, which literally means “the eternal cheerfulness and good fortune”. The pagoda presents the magnificent architecture of the country. It was used to be the place of a ceremony on the time of Vesak - the birthday of Gautama Buddha. The pagoda you see today is a new form refurbished from its remnants in 1995. People believe that if you go praying here, it will summon good health and wealth. The Perfume Pagoda is a gigantic complexity of Buddhist temples and shrines constructed into the mineral stone Huong Tich Mountains. This is the place of a spiritual event which attracts a large number of pilgrims all over the nation. An enjoyable boat trip across the picturesque waterway between limestone cliffs will cost about two hours; consent to an extra two or three hours to go up to the top. There are a great number of Buddhist pilgrims coming here usually in March and April. This period will be very busy that it would be much easier if you plan to go on an odd date. Thien Mu Pagoda is one of the oldest monasteries and significant culture centers in Vietnam. It lies on the banks of the Perfume River. The pagoda has seven storeys and which is the tallest building in Vietnam. Thien Mu Pagoda is bounded by flowers and patterned plants. Visitors can see a calm and romantic pine-tree forest stretches at the far end of the garden. Many people who travel to Thien Mu Pagoda feel that it is a magnificent place to gain knowledge of about the religious conviction. The pagoda is located on a remote island that takes less than one hour to reach the location. Take a tour throughout the holy places will give you an idea about the history of the nation as well as the culture of the local area. 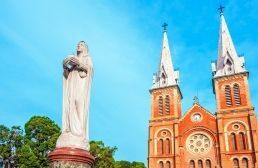 Get one step closer to the real, general Vietnamese style by discovering their religion and belief though these scared sites.